We have to admit that we love photographing children. 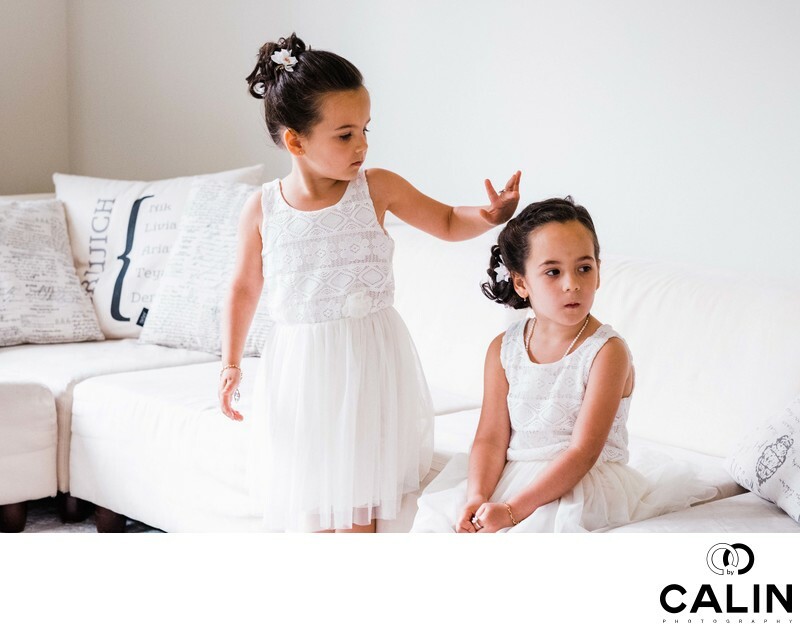 Even though we only to document weddings and according to my clients we are one of the best wedding photographers in Toronto, we love the candor and spontaneity children exhibit. During the bride and groom's preparation for their Kortright Centre wedding children gave us many opportunities to photograph them before tying the knot in the forest. The couple was initially thinking to get ready at a different location and then had to the special event at Kortright Centre in Woodbrige. Another option was to get ready at their own homes and then have a first look either in the forest or in the one of the buildings. As usually happens, it rained so we couldn't go outdoors. Also, the main building was being decorated for another event. As such, the bride and groom had to see each other for the first time on the Visitor Centre balcony. But I digress! This picture is about the two flower girls who, were enjoying the event before they headed to Kortright Centre. Here we can see the the older flower girl arranging the little ones hair so that everything looks perfect. Often things happen in the split second and the professional artist should always be ready to capture such moments. Even though in the past I've been known for prompting my subjects to repeat an action if I missed it, it is not ideal. As such, I try to anticipate what the couple, the family and the friends will do so I can position myself in the right spot to capture the perfect photograph. If unfortunately I'm not able to run in order to catch the exact moment I kindly asks the protagonists to repeat the act. The don't mind hugging again and even posing for the camera. After all everybody wants to make the couple's event perfect and don't mind having more fun. This time though I have to asked the girls to interact in front of the camera as they completely ignored me. To be invisible during the event is the photojournalist's dream and I came close to that at this event. The bride liked this photograph and included it in her wedding album. Speaking of getting ready pictures, many couples only come here for their ceremony. Generally, clients do not get ready at this event space and instead choose a hotel where they will also have the reception. While this location is a splendid natural setting, some couples feel it is not appropriate for their reception so the choose other locations in the Greater Toronto Area. Please check our complete guide for very detailed information on the places and events spaces that can host your dinner. Also, make sure you attend the open house held every year in January to see how the location looks decorated for such an important event.